The Great Irish Famine was a disaster hard to comprehend - two million people emigrated between 1846 and 1855. 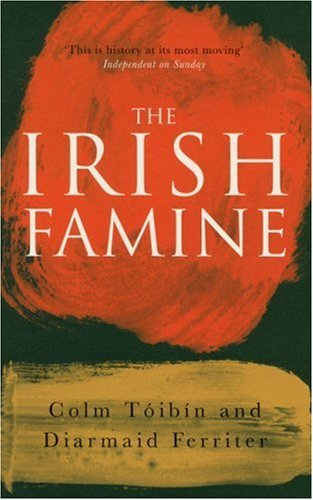 It seems strange that the famine barely appears in Irish poetry or literature. This book studies the way it was remembered and recorded. South," debuted in 1990. Tóibín wrote for The Sunday Independent as a drama or television critic and political commentator. He has penned several more novels and a travel book, plus edited anthologies and a book of essays, created a play, and written regularly for The London Review of Books. Tóibín's second novel, "The Heather Blazing," received the 1993 Encore Award, and "The Master" achieved the 2006 International IMPAC Dublin Literary Award, the Los Angeles Times Novel of the Year, the Stonewall Book Award, and the Lambda Literary Award. Tóibín has been a visiting professor or lecturer at many American universities. In recognition of his contribution to contemporary Irish literature, he received the honorary degree of Doctor of Letters from the University of Ulster in 2008.